199. The primary cause of the circulation of water by the force of gravity, in a hot-water heating system, is that the liquid becomes denser as it cools off, and it therefore preponderates over the warmer and lighter water and pushes it to the top of the apparatus. It should be clearly understood, that hot water will move only when there is a heavier and cooler body of water to displace it and force it upwards by means of its superior weight, or when some force, other than the force of gravity, is employed to move it. The driving force which propels the water in any given circuit which operates by gravity alone, is proportional to the difference in the mean temperatures of the ascending and descending parts of the circuit; and does not depend upon the actual quantity of water contained in those opposing parts of a system. With a given difference in temperatures, it is also proportional to the vertical height of the circuit. Thus, the motive force, or heart. in a circuit 50 feet high, would be twice as large as in one only 25 feet high. 200. 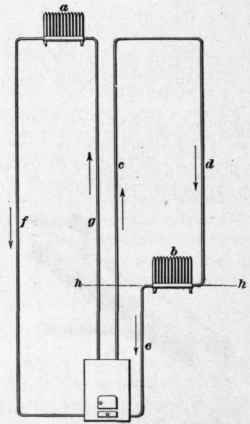 The force of the circulation through radiators, etc., with a given fall of temperature, depends chiefly upon the height of the return column, and is, in many cases, practically independent of the height of the supply column. Thus, in Fig. 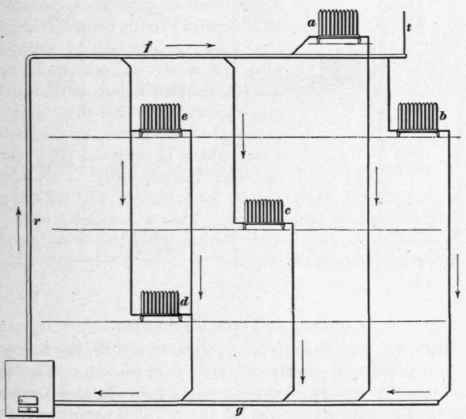 71, the circulation through the radiator a will be about three times as great as through b, notwithstanding the fact that the supply columns c and g are of equal height, because the return f is about three times as high as the return e. The temperature in the pipes c and d is supposed to be nearly the same; consequently, the column d simply balances an equal height of column c, and fails to supply any force for circulation. The force for circulation in this circuit, therefore, depends upon the preponderance of the weight of water in e. over the weight of that contained in the riser below the level of the radiator at the line h.
It will be seen that the only way in which the drop pipe d can be of service is to act as a cooler, and thus lower the temperature of the water which it contains. The same mechanical effect can be obtained, with less expense, by emitting an equal amount of heat from the radiator b. 201. 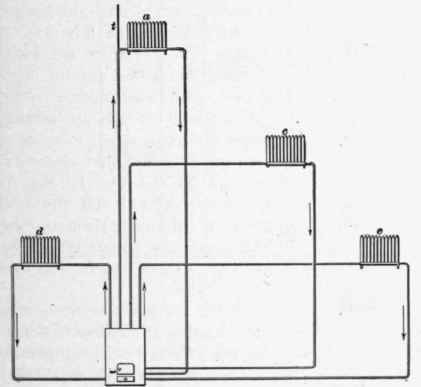 A simple circuit is one in which the water flows directly to a radiator through a single pipe without branches, and returns to the boiler through another direct and special pipe, as shown in Fig. 72. Although a large number of such circuits may be connected to a single boiler, each one is entirely independent of the others, and the force of circulation is governed by the actual height of each circuit and the difference of temperatures prevailing in it. 202. In a compound circuit the supply current moves in a main pipe of comparatively large dimensions, commonly called the flow main, and the return currents proceed to the boiler through a similar pipe called the return main. These mains are connected by a number of small branches, each of which makes a direct circuit between the flow and return mains. The radiators are connected to these branches, usually one on a branch, sometimes more. Compound circuits are arranged in many different ways, most of which are variations of the two systems shown in Figs. 73 and 74. In Fig. 73 the mains are vertical and the branches are substantially horizontal. In Fig. 74 the mains are horizontal and the radiators are attached to vertical branches or drop pipes. In the former case, the effect of rapid cooling at any one radiator is to decrease the average temperature of the return main, and, as all the radiators are connected to the same mains, the effect is divided and distributed over the entire system. In the latter case each radiator is independent, and the rapidity of the circulation through it will depend upon the amount of cooling which occurs at that point. 203. In Fig. 74 the radiators e and d are supplied from the same drop pipe, and both are connected to the same return pipe. The circulation through the upper radiator will always be good, but as long as that one continues in operation, the lower one is likely to fail, being unable to get any hot water. This is due to the fact that the pressure of the cool water in the return between e and d overbalances that of the hot-water column in the flow connection to d, and prevents it from flowing through the radiator. The trouble can be remedied, however, by providing it with a separate return connection to the main g, thus making it independent of the upper radiator. 204. Another method of operating.a radiator on a drop branch, or with a downward moving supply, is shown in Fig. 75. The flow connection to the supply pipe is made at one level, and the return is connected into the same pipe at a lower level. The circulation through the radiator will depend mainly upon the vertical distance between the connecting points d and e. The flow connection may be made to the top of the radiator, as shown at a, or to the bottom, as at b, as convenience may require. In the former arrangement each radiator will be supplied with hot water of practically the same temperature, but in the latter case the water in the drop pipe is lowered in temperature by the cooler water which is returned from each radiator; consequently, the water supplied to the radiators at lower levels will be successively reduced in temperature. This will usually make it necessary to employ larger radiators on the lower floors, when this system is employed.